It was the save that ultimately meant nothing. With moments of the game remaining, Colombia's Mateus Uribe unleashed a vicious volley from at least 30 yards that seemed destined for the top corner of the net. Without a doubt it would have been the goal of World Cup. 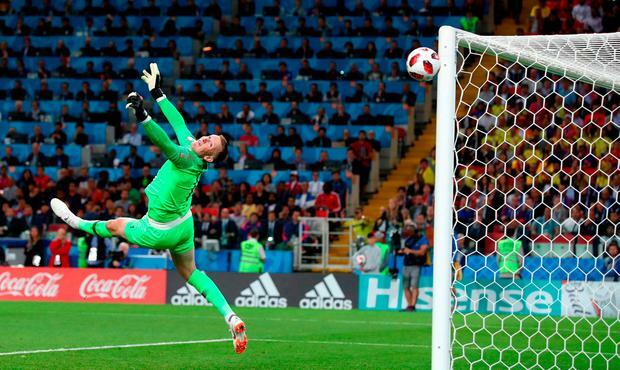 Instead, it turned out to be the save of the tournament, as Jordan Pickford - England's youngest tournament goalkeeper - flew across the goal, stretching out his left hand to tip the ball out for a corner. The moment could have gone down in history as the save that sent England through to the quarter-finals. Instead, his entry into English football lore had to wait until the penalty shootout after Yerry Mina rose highest to head in the equaliser from the subsequent corner. Inevitably it was the young keeper's heroics after extra-time - sticking out his left hand to deny Carlos Bacca from the spot - that grabbed the headlines. But his earlier save should not be forgotten, especially given the scrutiny he was under before the game. After the defeat to Belgium, his opposite number Thibaut Courtois, the Chelsea goalkeeper, drew attention to Pickford's height, suggesting his stature contributed to Adnan Januzaj's winner. If there was ever a time to justify his selection ahead of Jack Butland, it was against Colombia and the 24-year-old delivered. "Pickford's save from Uribe just before the equaliser is stupidly good. Hope it doesn't get forgotten amid everything else," journalist Jonathan Wilson tweeted. "What. A. Save," Piers Morgan wrote. "Take a bow Jordan Pickford." In an apparent reference to Courtois's comments, Pickford said after the game: "I've got that power and agility to get around the goal - I don't care if I'm not the biggest keeper, I've got that power and agility and I'm very good at (penalties)." England had researched Colombia's penalty takers beforehand and Pickford said: "We had a fair feeling, and (Radamel) Falcao was the only one who didn't go his (usual) way." Dier said of Pickford: "He was incredible, he's a fantastic goalkeeper and he was fantastic in the penalty shootout. "He's been fantastic in training for them and he's taken it into the game." Should England stick or twist with tactics for Sweden clash?